This flexibility provides a great variety of application possibilities, not to be realised up to now, compared to other flight fastening systems, as e.g. welding. 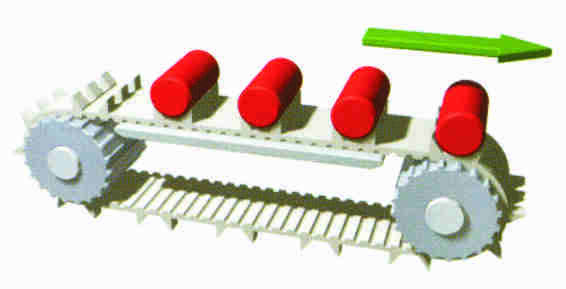 If required, it is possible to convey different items in one transport system using the same timing belt, but equipped with different flights. A high material value gives the basis for the BRECO-BRECOFLEX-TIMING BELT. It is constructed of a wear resistant polyurethane and a high tensile steel cord tension member. Additionally, in conjunction with a tooth side facing with polyamide the timing belt has a low coefficient of friction in the guide rail area. The BRECO TIMING BELT is available in unlimited lengths and with any number of teeth. These flights are made of polyurethane, the same high quality materials as is used for the timing belt itself. Below is a few examples of the profiles. Further special profiles are available. Depending on the customers requirements and within the framework of our production means, the flight shape can be freely adapted to the product to be transported and the special purpose. For whatever transport purpose the flighted timing belt is to be used - the back of the belt can be equipped with any number and order of welded-on flights. The welding of flights onto timing belts are done in our factory in Melbourne.